Examines workouts and foreclosure throughout the country, from protecting interests before foreclosure, to proven alternative methods, procedure, regulations, liabilities, confirmation, and redemption rights. Discusses available options, and strategies for planning and managing workout solutions. Includes expert analysis of, amongst others: workouts and other debtor—creditor relations, state-by-state coverage of mortgage and foreclosure procedures, interim protection for lenders, foreclosure and other terminations of mortgages, bankruptcy law and tax issues, third party claims and liabilities, contaminated property, and environmental issues. 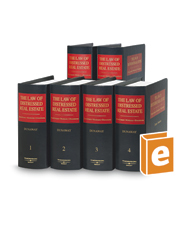 Provides jurisdictional summaries and tables of cases and statutes.